I read this article and found it very interesting, thought it might be something for you. 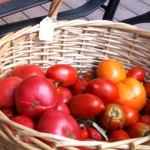 The article is called The Garden Dish Gardens – Our Favorite Tomatoes and is located at http://www.gardendish.com/garden-dish-gardens-favorite-tomatoes/. Are you struggling to decide which seeds to buy for your edible garden this year? Does the vast variety of color and size overwhelm you? Take a peek at a seed catalog and you can find hundreds of varieties to choose from. 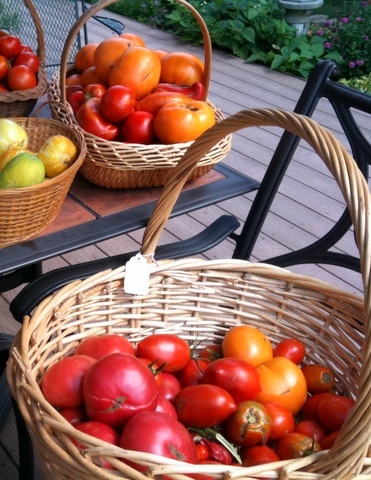 Gary Ibsen’s Tomato Fest online catalog offers more than 600 varieties of tomatoes! And those are just heirloom tomatoes, not including hybrids which have been the primary focus of the seed industry since about 1950. We’ve been growing edibles for 15 years now and have arrived at a relatively short list of our favorites. In each of those years we experimented with numerous varieties of tomatoes, green beans, potatoes, and other vegetables and fruits to find our favorites. In our southwest Pennsylvania gardens, these all grow well as long as we remember to water in the heat of the summer, give them enough space to get their share of nutrients, and mulch, mulch, mulch. The varieties that produced a reasonably large harvest of disease-free, good-flavored produce were kept in the rotation for future years. We remember years where we taste-tested 10-12 varieties of tomatoes, 7-8 varieties of green beans, 3-4 varieties of potatoes, 5-6 varieties of winter squash, and 2-3 varieties of lettuce, carrots, radishes, peas, onions, and garlic. Numerous factors affect the flavor of your harvest. The plant’s genetics and your garden’s environment (soil, water, sun, temperature) interact to affect flavor. And these obviously vary from location to location. So when folks ask us for our favorite recommendations of edibles, we first ask them where they live. If they’re local to where we garden, we’ll happily share our list. If not, we’ll still share our list, but with the disclaimer that their best bet is to try out several varieties each year and note the ones that grow well for them and tasted best. Kellogg’s Breakfast – these giant beauties of brilliant yellow-orange are one of our favorite summer breakfasts. We slice these thickly and layer on toasted homemade bread with a slice of extra-firm tofu. Sometimes with a sprinkle of Himalayan Black Salt to give it an eggy taste (if you like that flavor). Amish Paste – our favorite paste tomato because the fruit is large, and the plants are productive. Large size doesn’t always translate into tasty, but in this case it does. Long Tom – another superb paste tomato, this one is sausage-shaped. It’s narrow width let’s us drop it through the opening in our Vitamix Blender when we’re making sauce – including the seeds and skin which get pulverized by the Vitamix. Super easy! Sun Gold (hybrid) -fruity and sweet, we love to eat this while working in the gardens. It’s a burst of refreshment. Visitors are always amazed at this sweet treat. We pick a bowl full to serve to guests and at picnics. Cherokee Purple – loads of rich flavor, this is a favorite slicing tomato, along with Black Krim. Great on sandwiches, or just sliced and sprinkled with salt or sugar. Black Krim – rich, full flavor. Our favorite slicing tomato. We plant both Black Krim and Cherokee Purple for backup. If something happens to one (say, a hungry deer), we’ll hopefully have the other. Moonglow – beautiful, blemish-free, yellow orbs are still producing by the time our September apples ripen. So these have become our go-to tomato for making yellow tomato-apple chutney in late September. Martino’s Roma – very productive, more than other Romas we’ve tried. Note that we use only organic methods in our gardens, so you’ll find our recommendations are for organic seeds as well. We’ll discuss the reasons why in a future post – stay tuned. In the next few posts, we’ll list our favorite varieties of potatoes, green beans – surprise, there’s only one! – and winter squash from our years of experimenting here in our southwest Pennsylvania gardens. 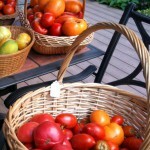 Let us know what varieties of tomatoes you’ll be growing where you live, and why. Inquisitive gardeners everywhere want to know.